Howling gales and blinding sleet aren’t everybody’s idea of ideal concert-going weather, but Glasgow’s Celtic Connections festival, now in its 15th year, has managed to defy all things meteorological with a game plan that can lure diehard traditionalists, ravenous world music aficionados and avid roots music punters to its box office in the kind of numbers more usually be associated with big-budget summer productions elsewhere. For this year’s festival, which finished last weekend, 120,000 tickets were sold. Steve Earle, Michelle Shocked, KD Lang and Teenage Fanclub jostled for attention alongside Capercaillie, Altan, the Savoy-Doucet Cajun Band, Bill Wyman and the Nedyalko Nedyalkov Quartet. And somewhere in the melee, Paul Brady and Andy Irvine reprised their eponymous 1976 album in the Celtic Connections classic-album concert slot. The festival’s presence is tangible everywhere in Glasgow. Posters on shop windows, musicians lugging instruments through rain-soaked streets and the constant movement of players in and out of the festival hotel bear testament to the city’s intricate relationship with Celtic Connections. Donald Shaw, festival director, is someone who knows a thing or two about this business. A founder member of Capercaillie, multi-instrumentalist and record producer, he’s quick to point out that although punters travel from across the UK, Europe and the US, 90 per cent of Celtic Connections punters are local Glaswegians, hungry for good music. “We tend to concentrate on the word ‘connections’ rather than the word ‘Celtic’,” Shaw admits, with a typical Scottish mix of candour and pragmatism. Shaw’s penchant for luring old collaborators back together was the impetus behind Andy Irvine and Paul Brady’s reunion last week. Although the pair share a long and winding history, through their days with Planxty and as a duo, they hadn’t performed together as a duo for years. Their 1976 album, Andy Irvine & Paul Brady, spawned Brady’s sublime version of what he calls “a deftly constructed drama”, Arthur McBride, a beautifully crafted tale of military arrogance pitted against local wile, alongside Irvine’s calculus-like Autumn Gold, a paean to his days travelling the highways and byways of eastern Europe. Produced by Donal Lunny, with Kevin Burke on fiddle, it was a masterpiece of restraint, a snapshot of two musicians in thrall to the music. BRADY AND IRVINE make no secret of the fact that they embarked on this reunion with no small amount of trepidation and, at times, foreboding. “We were, both of us, very apprehensive about this huge thing we took on,” Brady admits, post-concert, after the pair had stilled a rapt audience. Amid the occasional stray chord and the intermittent sound glitches, they summoned a rare magic as they tiptoed lightly across the Plains of Kildare, Bonny Woodhall and a pristine take on Lough Erne’s Shore. After a first-half warm-up that included a visceral version of what Brady referred to as the politically incorrect Wearing the Britches and a blistering rendition of The Connaught Man’s Rambles, they loped off stage, to let the temperature rise further before kicking off with a strapping airing of Martinmas Time. Irvine and Brady reignited a spark that’s been behind the conversion of more than its share of diehards to the intricate delights of folk music. “Going back 32 years is never going to be perfect,” Irvine adds, his face etched with a mix of relief and exhaustion in the aftermath of the gig. Having returned from Australia, where he escapes from the northern hemisphere’s winter darkness every year, Irvine had headlined the Temple Bar Trad Festival for four nights with Mozaik, then played two warm-up concerts with Brady in the Cherry Tree in Walkinstown, before sidling on stage in Glasgow’s Royal Concert Hall with his customary modesty not just intact, but defining his every note and lyric. Brady makes no bones about the challenges that such a reunion poses for two musicians who’ve taken vastly different paths in the intervening period. “It’s not just about music. It’s about everything else,” he declares. “It’s about who we are and who we were and the 30 years in between. It’s also about what your energy flow is like and what his is like. When I was working with Andy, I was still trying to find out who I was, so you have to go back to that younger person and relate to that. I don’t think we see the music in a different light, but we see ourselves differently. Those arrangements are as valid now as they were then, and we didn’t see the need to reinvent them. Having had the luxury of the contributions of Kevin Burke and Donal Lunny on the original recording, Irvine and Brady were faced with having to fill a blinding void with their own instruments: bouzouki, mandolin, mandola, guitar, harmonica and keyboards. As Brady pointed out on stage, it’s a lot tougher to get “match fit” when you’re revisiting a repertoire that’s more than three decades old. It’s tougher still when half the players are missing from the pitch, yet it was exactly that concentration of energy that propelled them into the belly of the music, Brady believes. Ignoring the Celtic Connections offer to provide them with an opening band, which would have absolved them of playing anything more than the 45-minute set that was the album, Brady and Irvine chose the road less travelled, the one with the unpredictable bumps and potholes. Why would they go through the rigours of rehearsal for a reunion that was so fleeting, when this was an opportunity to revive so much more of their intricate repertoire? Irvine laughs as he recounts the process of readying themselves for the limelight again, as a duo. BRADY AND IRVINE’S yin and yang is indisputable on stage. Irvine sits stock still; Brady is a fireball, zigzagging across the stage with the pent-up energy of a prize fighter. Still, whatever of the triumph of the night’s performance, Brady is non-committal about his future plans. After the show, the pair jostle and jibe with one another, high on the relief that the show is over, that they’d met the challenge head on and enjoyed it so much. Despite their vast experience though, or perhaps because of it, they sweated long hours before bringing this music back into the daylight. Brady jokes that he cursed Irvine as he waded through the complexities of the chord structures on Autumn Gold. Andy did likewise as he struggled with Lough Erne’s Shore on the hurdy-gurdy, all of which suggests that music was, and never will be, an autopilot pursuit for either of them. Here’s a nice piece written by Leagues O’Toole author of the must read “The Humours of Planxty” book. Liam O’Flynn’s abilities first came to prominence as a member of the cutting-edge trad-folk band Planxty. There has been a sad sense of anticipation leading up to the passing of Liam O’Flynn, or Liam Óg Ó Floinn as he was often referred to, amongst those who knew of his illness. O’Flynn was no ordinary musician. There was something deeply significant about his work with the ground-breaking group Planxty, his remarkable solo recordings, his collaboration with late poet laureate Seamus Heaney, and other landmark projects such as The Brendan Voyage with composer Shaun Davey in 1980. It’s also no coincidence that O’Flynn graced the recordings of some of the music world’s deepest thinkers such as Kate Bush, Emmy-Lou Harris and Enya. Liam O’Flynn’s abilities first came to prominence as a member of the cutting-edge trad-folk band Planxty, put together by Christy Moore and also featuring Dónal Lunny and Andy Irvine. 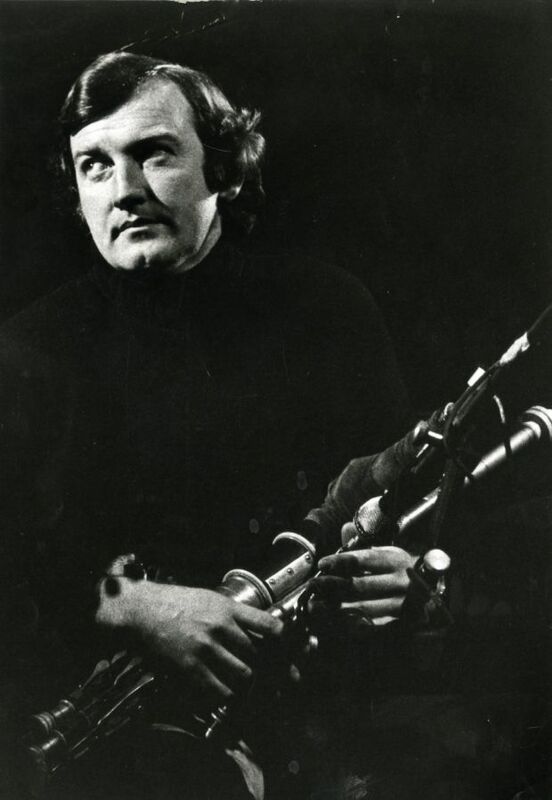 His piping and tin-whistle playing were central to the band’s exhilarating opening period in the early 1970s, beginning with Moore’s Prosperous album and the game-changing Planxty debut “the Black Album”. 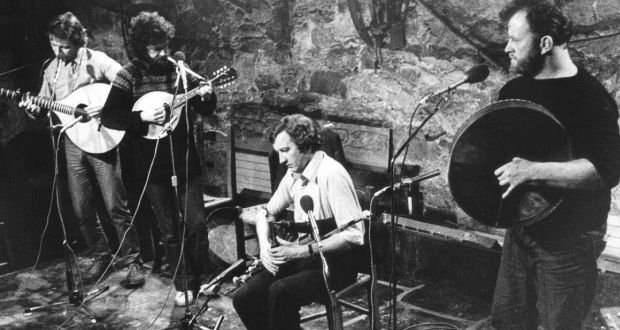 A regular feature of the Planxty performance was when the other musicians put down their instruments as O’Flynn performed a solo air or “aisling”, which always brought the venue to a meditative standstill followed by an emotional eruption of applause. O’Flynn was universally considered a kind, thoughtful and private man. He lived in Kildare, where he felt a deep affinity with the land and a shared love of horses with his wife Jane, a well-known showjumper. The Kildare-born musician began his journey with the uilleann pipes under the tutelage of the great Leo Rowsome, and quickly became a star apprentice winning numerous prizes at Oireachtas and Fleadh Ceoil competitions. He later developed under the guidance and influence of two giants of piping, Willie Clancy and Seamus Ennis. Through these influences O’Flynn developed an important understanding of the role he played within the tradition and lineage of Irish music culture. As he said himself: “Seamus Ennis gave me much more than a bag of notes.” And O’Flynn, as Master Uileann Piper of Ireland, never compromised this position once, leaving a perfect legacy for generations of younger musicians within this “living tradition” to learn from. Micheál Martin should bottle and dispense Planxty: with curative properties that should tackle every ailment from ingrown toenails to cancer. Endorphins were flowing so fervently across the entire audience last Friday in Vicar St that we levitated rather than ambled towards the exits. There was an air of expectation hanging over the crowd beforehand that would fire a rocket launcher. 23 years is a mighty long time to wait for the rekindling, but somehow we guessed that the wait would be worth it. Just as soon as Liam Ó Floinn exhorted the rest of them to ‘take it away boys’, we knew we were on home turf and that not only would the sods be cut, but that they’d be turned, footed and loaded on the trailer by the time the lights came up, an exhilarating two hours later. Ó Floinn’s invisible readying of the bellows, Lunny’s and Irvine’s intricate tapestry of bouzouki and mandolin, and Christy’s nervy introductions had the sardine-packed audience on the edge of their seats from the get go. Lunny’s bouzouki has always been credited as the engine of the band, and rightly so, his muscular, driving rhythms marking out their territory. Andy Irvine’s mandolin and guitar cross-stitched in between with that old familiar ease, his vocals lending their characteristic finesse to the pot. And Christy’s sheer ebullience guaranteed that the epic sagas such as The Good Ship Kangaroo gathered all before them in their welcoming gabháil. But Liam Ó Floinn was the lynchpin that not only held them together but bolstered them so securely that they could take flight. His utterly controlled, surgically precise reading of everything from Sí Bheag Sí Mhór to Tabhair Dom Do Lámh and An Buachaill Chaol Dubh was enough to lure the hardiest of piping allergists into the midst of the mêlée. And when he sidled into the heart of Christy’s ultimate set piece, that spellbinding, 26 verse tale of adultery, murder (and true love) that is Little Musgrave, well, some of us simply exited the planet at that moment, content to float free on the sheer genius and magic of the ensemble playing. They acknowledged their inheritances generously, from Ballyvourney’s Elizabeth Cronin to Mickey McConnell and John Reilly. They traced the thread from Turlough O’Carolan all the way to the anonymous donation of Little Musgrave, found by Christy on a series of loose pages languishing on an auctioneer’s floorboards. There were punters there who probably still have the stubs of their tickets from the early days. Everyone just knew that this was going to be something special. For those of us who’d lived their music through the albums, never having witnessed them in 3D, it was akin to an awakening. Liam Ó Floinn’s pipes were the real revelation, the Marilyn Monroe who burst from the cake at JFK’s birthday party. Breaths will be held in anticipation of their live album, and after that, who knows? But these boys’ appetites for one another’s company won’t be easily sated by a dozen New Year gigs. New tunes are lurking very close to the stage door. We could almost hear them tiptoeing towards Lunny’s bouzouki as we floated home. It’ll doubtless go down as the most anticipated (and long awaited) re-union in Irish music history. More than thirty years after they first transformed the possibilities of Irish music forever, the Crosby, Stills, Nash & Young of trad/folk finally decide to re-convene for a series of gigs. It’ll doubtless go down as the most anticipated (and long awaited) re-union in Irish music history. More than thirty years after they first transformed the possibilities of Irish music forever, the Crosby, Stills, Nash & Young of trad/folk finally decide to re-convene for a series of gigs. It was always going to be a bit special but few could’ve predicted the reaction when it finally happened; ten sold-out gigs with many travelling from abroad to witness what may well become known as the “third coming”. The venue helped hugely – Vicar St. is the perfect location for such a celebration – intimate enough to make it involving for the audience and big enough to cater for the demand. It was better than anyone could have hoped. Looking remarkably fit and healthy, the original line-up of Donal Lunny, Andy Irvine, Liam O’Flynn and Christy Moore strode out to a heroes welcome. Clearly well-rehearsed, they trawled the hallowed Planxty back catalogue with renewed vigour. Along with some unforgettable ensemble playing (their strongest point), they each took the spotlight in turn; Christy performed a stunning pair of ballads, including a particularly breathtaking version of ‘Only Our Rivers Run Free’. You could hear a pin drop as Liam O’Flynn took centre stage for a stunning, ‘Buchaill Caol Dubh’, while Andy Irvine’s ‘West Coast of Clare’ was as moving as ever. Donal Lunny’s bouzouki playing tied it all together magnificently. It was also a night of stories and fond reminiscences. Christy remarked that the band had talked about getting back together more than once over the last 20 years. “We’d meet up, play a few tunes and then go home and forget all about it,” he laughed.” He went on to say that they finally decided to take the plunge after watching Leagues O’Toole’s No Disco documentary special. It was that kind of night. Encore!